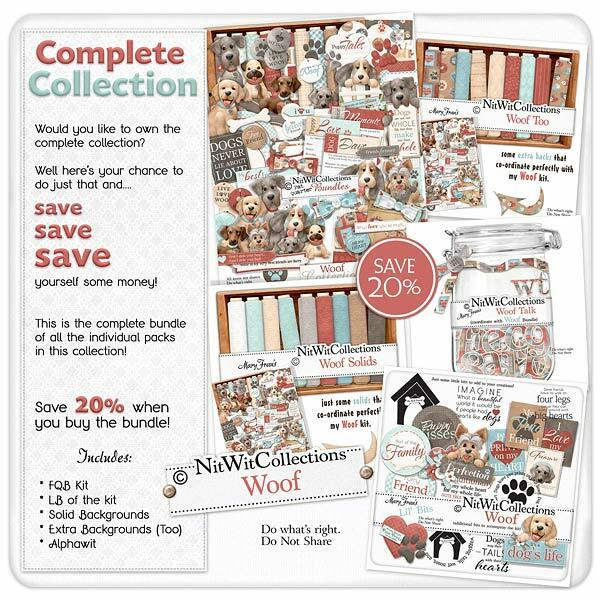 Bundled "Woof" Collection has "gone to the Dogs"! It is an incredibly fun digital kit to celebrate your best furry friend with. We all know a dog lover and we all know how many photos and occasions we have for our beloved dogs. This kit has it all to create the most wonderful scrapbook layouts, mini albums and cards! The rich colours and varied background papers will start your creating with ease and adding in the unique elements such as the dog tags, journal cards, paw prints, and of course your favorite canine will give you stunning results that befit your loving companion. We hope that you can enjoy creating with the same enthusiasm as your pet has for you!